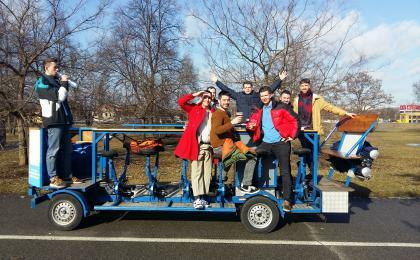 Looking for fun activities in Prague? Try foot darts. 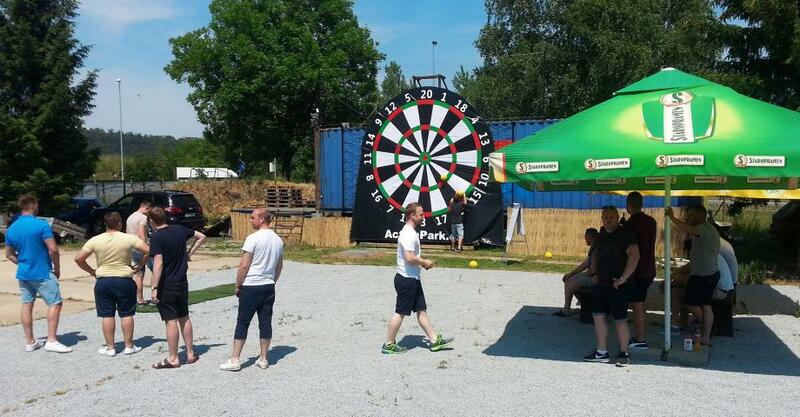 It’s an absolutely irresistible combination of football and darts. If you want to relax, enjoy sport outdoors and have fun with friends. Foot darts will definitely make your day. 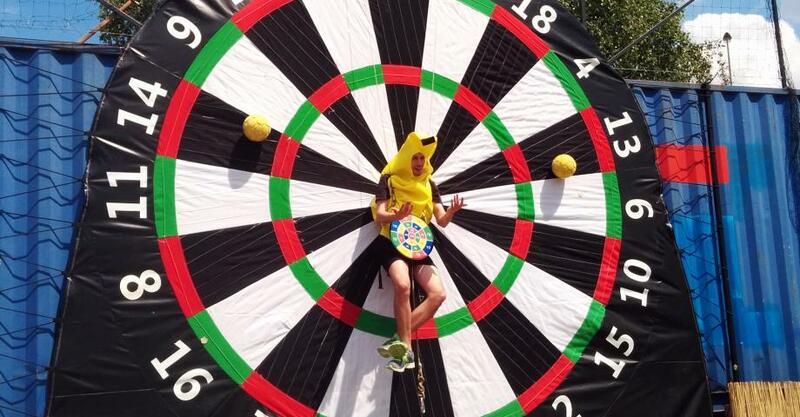 There’s a huge inflatable dartboard and you’re kicking a football ball against it to get the highest score similarly to regular darts. The score is being registered by the dartboard. It’s a great way to let off some steam, get a bit of exercise and just fool around. 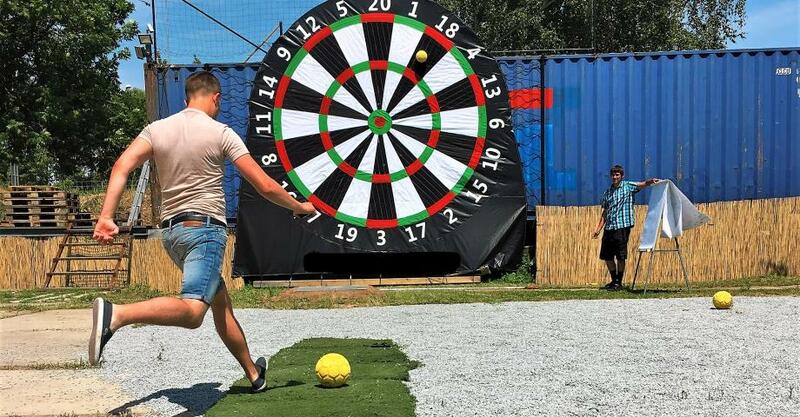 So if you’re looking for things to do in Prague and you’re in the mood for some unorthodox sporting fun, come and try foot darts. There’s a personal organizer at your hand to give you any instructions needed and you will get pictures of the game to recall the fun. After you arrive an experienced instructor will be at your service. At first, you can try a few shots. Then you will learn the rules of the game. The instructor will count points and also take the balls off the giant dartboard for you. You can try various scenarios. We also have quite a unique scenario ready for you, during which you pick your victim and then we hang him up to the center of the dartboard. Then you can try to hit him with the balls! 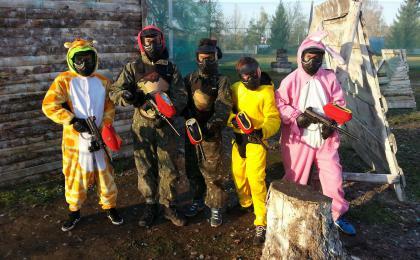 For stag parties, funny costumes (piggy, rabbit, minion, pokémon Pikachu) for the Bachelor are available for free. Price includes: an instructor, a glass of beer, photos. Foot darts can be played in any weather (even in the snow) - depends on the toughness of the players. The action takes 1 hour. 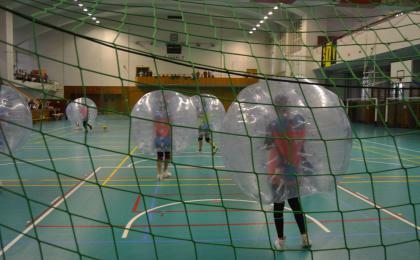 You can add another activity to your program in the action park (archery tag, paintball, giant beer pong, human table football, binocular football or bodyzorbing and bubble football). You can also order 200 g chicken/pork BBQ with local draft beer, bread, sauce, and vegetable. Price: 169 CZK / person. The activity is designed for a group of 5 people. Minimal age is 12 years. It is recommended to wear comfortable sports clothing and sturdy shoes. Take a spare T-shirt to change after the game. Other equipment will be loaned. TAXI: Transport from the city centre available on demand for price CZK 500/ up to 8 persons/ one way. CAR: Place of this activity is easily accessible by car. There is no problem with parking in the area. Distance from Prague centre: 15 km, travel time: about 30 minutes. You can also get there by public transport. Check Google Maps for details.